Now I know what your thinking but let me dispel the rumors now. “Fricke and Nacke” out of Western Germany is in no way related to the Swiss skaters “Frick and Frack”. I just had to get that out of the way! 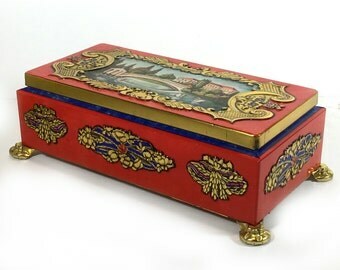 I stumbled across this tin box recently by Fricke and Nacke, and my heart melted. There are a few things that I will always purchase without question and one of them is anything on gold/brass claw feet. Little, tiny, brass, gold, claw feet…always win. 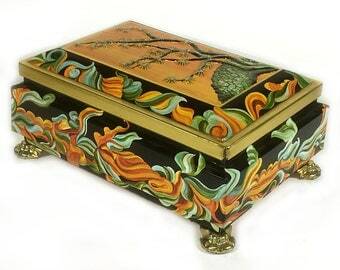 In this case, it came in the form of a tin box with beautiful apricot colored birds and flowers on it. 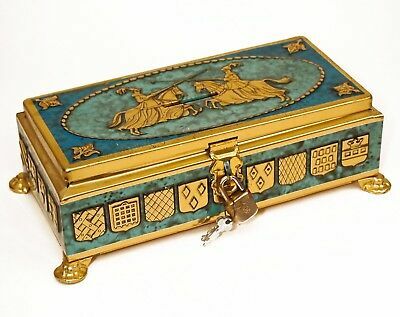 As it turns out, this little tin box once held English Toffee and is made by “Fricke and Nacke”. I assume the name of two Germans? But let me tell you the internet is sparse on this. Perhaps this little box is from the 1950’s (so I have read). If you have any more information I’d love to hear your comments. Here is why I’m drawn to it. It really reminds me of a few things going on in today’s trending world. I absolutely love Dana Gibson lamps. The reason? They sit on brass claw feet. I simply adore any Chelsea House cachepot. Why? They sit on brass claw feet. So I opt for the Vintage goods and I’m so excited to find that Fricke and Nacke were somewhat of pioneers on creating little affordable goods on tiny brass claw feet! It is like they knew they had to fill the void of affordability in this category. For anywhere from $15-$40 you can own a little gold feet gem box. They are just tin boxes but they are so beautifully detailed.